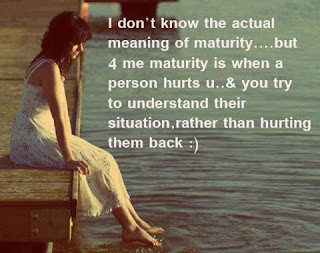 If I were asked, "How can you tell if a person is mature?" I would respond by saying, "If a person consistently acts in a mature manner, he would be a mature person. However, if on the other hand he consistently acts in an immature manner, you can be certain that he would be an immature person." As Aristotle said, "We are what we repeatedly do." First, emotional maturity. What many fail to see is that we cannot have spiritual maturity without a healthy level of emotional maturity. While our spiritual maturity will be reflected in the quality of our relationship to God, emotional maturity will be reflected in the quality of our relationships with people. They go hand in hand. As God's Words say, "If anyone says, 'I love God,' yet hates his brother, he is a liar. For anyone who does not love his brother, whom he has seen, cannot love God, whom he has not seen. "1 Many may disagree, but in reality I'm no closer to God that I am to people. Among other things, emotional maturity means we will have a healthy self-concept not thinking too highly or too lowly of ourselves. We will also have a healthy sense of self-acceptance and self-worth, which are both vital for loving relationships and making the best use of our life. We were created for relationships and thus healthy relationships are vital for both physical and emotional wellbeing, while impaired relationships are one of the main causes of unhappiness and a major cause of stress, anxiety and physical ills. Spiritual and emotional maturity will pretty much guarantee that we will have quality relationship with God, others and our self. "Emotional maturity means we will have a healthy self-concept not thinking too highly or too lowly of ourselves." Second, being personally responsible. Another vital characteristic of maturity is acting responsibly and appropriately in all situations ... neither overreacting nor underreacting. People overreact when an unresolved issue from the past is triggered and they reenact a response to this past painful event that has never been resolved. People underreact when they withdraw from dealing with an issue they need to confront. Some excuse this as being Christian and not wanting to hurt someone's feelings when, actually, it is basically being weak, afraid, or insecure—not to mention being dishonest. As John Powell so eloquently said, "We defend our dishonesty on the grounds that it may hurt another person and then, having rationalized our phoniness into nobility, we settle for superficial relationships." Being responsible means we refuse to play the blame-game. Consistently blaming someone else for problems will cause us to B-LAME! When working in divorce recovery workshops over the past couple of decades I have found that almost all people in impaired relationships primarily blame their partner for the breakdown in the relationship. They forget that it takes two to tango and that they have contributed to the problem, whether by being too weak, too passive, or too co- or over-dependent, and what it was that attracted them to their partner in the first place. On one occasion a friend once said to me, "Are you angry at me because I've been divorced three times?" "Angry, no," I answered, "afraid, yes!" "Well they were all jerks," she responded. So I asked, "Well, why did you marry them?" Sadly my friend is now on her fifth marriage. The reality is unless we act responsibly and admit, confront, and resolve our personal issues, we are destined to repeat them. It's either resolution or repetition. Maturity necessitates that we face and resolve all past conflicts and come to the point where we genuinely forgive all who have ever hurt us. Failing to forgive only hurts us. It's "like drinking poison and waiting for the other person to die." Furthermore, blaming others for the difficulties we have keeps us forever locked into and bound by the past. Past experiences may have been excruciatingly painful, and we may not have been responsible for what happened to us, but as adults we are totally responsible for what we do about overcoming the effects they had on us and for what we become. Being personally honest is challenging because it means not only being honest in all of our dealings with others, but also being honest with ourselves. This includes being honest with our true feelings/emotions (many of which have been long since buried and denied—a very unhealthy way to live). It also means being honest with our motives. This may be the most challenging area of personal honesty because most of us have hidden agendas be they conscious or subconscious. Hidden agendas cause people to become disgustingly manipulative. Being honest is being real, transparent, and authentic. It's a tough call but the only healthy and mature way to live. It means being known for who we truly are—warts and all—by at least one or two trusted friends. It allows us to see and acknowledge both our strengths and weaknesses which, in turn, helps us to develop and use our strengths and work on overcoming our weaknesses. Fourth, spiritual maturity. This will be seen, not in how well we know our Bible, how many church services we attend, or how many religious activities we are involved in, but in having a healthy relationship with God. In fact, over-busyness in religious activities may be a cover-up of some level of immaturity. Think of Mary and Martha, friends of Jesus, when Jesus came to visit in their home. I can imagine how excited Martha was as she busily labored in the kitchen over a hot oven to prepare a wonderful meal for their special guest. However, she complained to Jesus about Mary who wasn't helping with the preparations, but just sitting and visiting with Jesus. Sounds a reasonable complaint to me. I probably would have been ticked off with Mary too. However, Jesus saw it differently. In our language, Martha was probably a bit of a workaholic keeping busy to avoid facing some painful issue in her life. On the other hand, relating to Jesus was more important to Mary than busily preparing a meal for him. What Martha and Mary were both doing was important, but what was more important was the motive and reason behind what they were doing. It's good to do work for God but more important is the motive behind what we are doing and relating to him first. Loving and relating to God is a vital part of spiritual maturity. Service is to follow from a heart of love, not as a way of avoiding an unresolved personal issue. I assured this lady that while I disagreed with her lifestyle, I did love and accept her. Last, but certainly not least, is love, unconditional, love. To genuinely love God, others and myself is the highest and noblest fruit of maturity, and as long as I have room to grow in love, I will have the need to grow in maturity. To love unconditionally doesn't mean that we love or even like what others do. It means that we accept them as fellow strugglers and fellow sinners because, in God's sight, we have all sinned and fallen short of His standard of perfect holiness It means that we don't try and fix people or give them unsolicited or unwanted advice. It means we are there for them, to listen to them, and accept them for who they are even while we may disagree with their manner of life. In one of my live-in week retreats some time ago there was a lady whom I will call Josephine who was furious at me because I had called a certain behavior that she was involved in a sin and an abomination in the eyes of God. She angrily blurted out to me in front of the entire group, "You are nothing but a pharisaical religious _ _ _ _ _ _ _!" I admit that I was somewhat taken back but I answered calmly, "Yes, sometimes I am." This of course defused the situation. After this I assured this lady that while I disagreed with her lifestyle, I did love and accept her. At the end of the week, having lived in with a group of Christians—none of whom judged or rejected her—she came to me and said, "Maybe you are right after all," and then she actually hugged me. Amazing. This was possibly the first time in her life that Christians hadn't judged, criticized, and/or rejected her. If fellow sinners are going to come to Jesus, while we disagree with their actions and behavior, we need to show them unconditional love and acceptance. A tough call to be sure, but unconditional love is the highest fruit of Christian maturity. "Tell me whom you love," Houssaye asked, "and I will tell you who you are." Let us remember, too, that growing in maturity is God's will for all of us. As the Apostle Paul wrote, "Him [Jesus] we proclaim, warning everyone and teaching everyone with all wisdom, that we may present everyone mature in Christ. For this I toil, struggling with all his energy that he powerfully works within me."